Here’s a comprehensive but accessible guide to building a high-yield low-risk portfolio of shares. It’s the strategy behind UK Value Investor’s model portfolio, it’s the strategy I use to manage my own investments and it’s based on the work of Benjamin Graham, one of the great stock market investors of the 20th century. Growth is the friend of the long-term investor. Without it, the value of any business and the income from it will be eroded by inflation. While bad companies might luck into the occasional growth spurt, only good companies can grow year after year after year. A company’s long-term rate of return on its productive assets – its profitability – is one of the first things you should want to know before you invest. No matter how prosperous a business may be, if it has large financial obligations it might be a ticking time-bomb waiting to go off when something goes wrong. Companies that produce high rates of return over long periods must be doing something that can’t easily be copied by their competitors. This something is the company’s competitive advantage. When you invest in a high yield stock and it cuts or suspends the dividend for a prolonged period of time, that’s a yield trap. You can reduce the odds of investing in yield traps by asking a series of questions designed to uncover hidden problems. Dividends are an essential component of any high yield portfolio and the more you can get for your money, the better. Sustainable dividends must be consistently covered by earnings, otherwise a dividend cut could be just around the corner. Investing in the stock market works best when you take a long-term view. That means focusing on where your portfolio could be in five or ten years’ time instead of worrying about whether your shares have moved up or down this month. Nobody can guarantee that an investment will work out well. The answer to this unpleasant fact is to diversify, which means putting all your eggs into many different baskets and keeping those baskets as far apart as possible. The truth is that some companies will go from good to bad and some shares will go from cheap to expensive. To use a gardening metaphor, it makes sense to occasionally weed out diseased plants and trim back those that have grown too large. No investment strategy is perfect and anyone who thinks they know everything about investing is mistaken. A far better mindset is to be willing to admit to your mistakes, to learn from them and to avoid repeating them. And learning from your successes is a good idea too. Growth is the friend of the long-term investor as without it, the value of any business and the income from it will be eroded by inflation. With high-yield low-risk investing, what matters most is a company’s ability to pay a growing stream of dividends over a long period of time. This is as important for capital gains as it is for income, because long-term dividend growth is the primary driver of long-term share price growth. Growth over a year or two is a poor guide to future growth, so growth should be measured over a longer period of time such as ten years. This will help you to focus on those companies that have proven themselves over and over again. Sustainable long-term dividend growth is the ultimate goal, but long-term dividend growth is only possible if earnings are growing, and long-term earnings growth is only possible if revenues are growing. That’s why it makes sense to look for growth at every level, from revenues through to earnings and dividends, and in each case over a ten-year period. Any company that manages to grow its revenues, earnings and dividends significantly over a ten year period is far more likely to be a sustainable, successful business than a “flash in the pan” growth story. Only invest in a company if it grew faster than inflation (approx. 2% per year) over the last ten years. A reasonable definition of a high quality company is one that has been consistently successful in the past. Companies that are consistently successful over many years are more likely to be consistently successful in the future. That applies as much to cyclical companies as it does to defensive companies, so high-yield low-risk investing does not have to completely exclude cyclical companies. There are many aspects of a company that could be checked for consistency, but here we’re looking for relatively consistent growth across revenues, earnings and dividends. Companies that have consistently paid a dividend, consistently made a profit and consistently grown their revenues, earnings and dividends are much more likely to be consistently success in the future as well. Only invest in a company if it grew its revenues, earnings and dividends at least 50% of the time over the last ten years. As with savings accounts, a company’s rate of return on the capital invested (i.e. its profitability) is highly relevant. There are a couple of reasons for this, which I’ll explain with an example. Imagine that a widget manufacturer decides to build a new factory for £1 million. The widget factory produces a profit of £50,000 per year, or 5% of the cost of the factory. Now imagine a dongle manufacturer which also decides to build a factory for £1 million. The dongle factory produces a profit of £200,000 per year, or 20% of the cost of the factory. All else being equal, which of those sounds like the best investment; the widget factory or the dongle factory? Obviously the dongle factory is the best investment because the returns to shareholders are much higher for each pound invested. Other than higher returns today, highly profitable companies are also able to grow more quickly and with less need for debt. Using the widget and dongle examples again, it would take the widget company 20 years of saving its profits in order to be able to build another widget factory. The dongle company can save up its profits and use them to build a new factory after just five years. The widget factory can speed things up by borrowing to build, but that’s a risky strategy which I’ll cover shortly. Only invest in a company if its ten-year average return on capital employed (ROCE) is above 7%. No matter how prosperous a business may be, if it has large financial obligations it could be a ticking time-bomb waiting to go off when something goes wrong. Debt is one of the main corporate killers. Fortunately, many of the best companies don’t need to use a lot of debt to generate outstanding returns for shareholders. It’s also true that some companies can handle more debt than others. Generally speaking, the more cyclical or volatile a company’s earnings are, the less debt it should have. More stable companies, like supermarkets or utilities, can usually handle more debt. However, this doesn’t mean that they should handle more, because even supermarkets and utility companies can run into problems (as many investors are now well-aware). One approach to measuring indebtedness is to compare a company’s debts to its five-year average profits. This is a sensible approach as both interest and the original debt must be paid out of profits, and comparing debts to a company’s average profits over several years can smooth out the ups and downs of any one year. Another major financial obligation for many companies is their defined benefit pension scheme. With these schemes the company is obliged to pay out a pre-defined pension, regardless of how well an employee’s pension pot has grown. If the pension pot is not large enough then the company has a legal obligation to make up the difference. As with interest-bearing debts, it’s a good idea to compare defined benefit pension obligations against a company’s five-year average profits. Only invest in a company if its debt to five-year average profits ratio is below four for cyclical companies or below five for defensive companies. Only invest in a company if its combined debt and pension liabilities are less than ten-times its five-year average profits. Because of the competitive nature of capitalism, any company that consistently generates high rates of return will attract a lot of competition. After all, if someone at the end of your street started selling 1,000 bananas a day with a 100% return on every banana, you’d probably start buying and selling bananas as well. Of course, you’d sell them at perhaps a slightly lower price, giving you a 99% return and a price advantage over the other guy. That wouldn’t last long though, and you’d soon be in a price war until your margins were so thin – and your profits so low – that at some point one of you would give up. An intangible asset is something which boost profits but which you can’t touch or feel. This includes brand names, but only if the brand name helps the company sell more products at higher prices. Other examples are patents, which effectively bar competitors from using similar technologies or ideas, or industry regulation, which can act as an effective barrier to new competitors. A switching cost occurs when it is expensive, in terms of time, effort or money, for customers to switch to one of the company’s competitors. Examples of high switching costs include bank accounts and computer software, where switching to a new provider can involve lots of work, hassle and potentially expensive mistakes. Network effects occur when a company’s products or services become better as more people use them. Network effects often leads to “winner takes all” industries with good examples being Facebook and eBay. With these companies the users are part of the product and competitors who have fewer users find it very hard to compete. The classic cost advantage is economies of scale, but better processes, better locations and unique locations (such as the best location on a high street or the world’s cheapest oil field) can also help. Yield traps are high yield companies that look cheap but then turn out not to be when the company’s revenues, earnings and – most importantly – dividends take a prolonged decline. Yield traps can usually be avoided by sticking to the various rules covered so far, by investing in steadily growing, highly profitable low-debt companies. However, this is not always enough and some value traps can still fall through the net. To reduce the odds of that happening, it’s a good idea to drill into each potential investment with a series of questions designed to uncover potentially serious but less obvious problems. Has the company been in the same industry, doing the same thing, for a long time? Is the company one of the market-leaders? Does the company have a highly successful and profitable past beyond ten years ago? Does it rely on major contracts or patents which will expire in the next few years and must therefore be replaced? Has it made any large acquisitions, or acquisitions in areas where it has no expertise? Has it been free of major crises in the last decade? If not, how were they resolved? Is the company facing any obvious threats to its future in the short or medium-term? Is there a realistic chance that the company’s core business could become obsolete in the next decade? So far we’ve looked at the quality of a company in terms of its growth, consistency, profitability and indebtedness. Now it’s time to look at the value side of the equation. In investment theory, the value of a company is equal to the present value of all future dividends and other cash returns to shareholders. So the larger the dividend, or the more quickly those dividends are growing, the more valuable a company should be. That’s fairly obvious, and as investors seeking high-yields and low-risks, we should be looking to buy shares with the highest sustainable yields, and highest sustainable growth rates. The obvious way to build a high-yield portfolio is by looking at the dividend yield. However, on its own the dividend yield can be misleading as it only looks at last year’s dividend payments. If last year’s dividend was abnormally high or low then it may bear little relation to the dividend that will be paid in the future. And as income-focused investors, future dividends are what we should really be concerned with. One way around this problem is to compare a company’s current share price to its average dividend payment over the last few years. This will – in most cases – provide a more stable and accurate measure of value than the standard dividend yield. In fact, looking for high quality companies where both the long-term and short-term dividend yields are higher than the market average is a good way to begin to narrow your list of quality companies to those that are attractively valued. Only invest in a company if its price to ten-year average dividend ratio (PD10) is below 60. Only invest in a highly cyclical company if its PD10 ratio is below 20. Comparing price to earnings is probably the most common way to value a company’s shares. It even makes sense even for a dividend investor: dividends are ultimately paid out of earnings and so – on balance – the more earnings you can get for you money the better. The PE ratio has its problems though. Earnings from one year to the next can be volatile, and earnings this year may not be representative of what a company can earn under normal conditions. For example, if Marks & Spencer’s earnings declined by 50% from one year to the next, it would probably be unreasonable to expect its earnings to stay at that lower level forever. Of course they might do, but a more reasonable assumption would be that the earnings decline was temporary. In all likelihood, Marks & Spencer’s ability to generate earnings over the long-term would be roughly the same as it was before, especially if it still had the same number of stores, employees and products. A company’s long-term earnings power is what investors should focus on, rather than the level of earnings in one particular year. A good way to estimate earnings power is to look at a company’s average earnings over a period of years, as we did with dividends. We can then calculate a more stable and accurate ratio between earnings and price by comparing the current share price to those average earnings. This is exactly what Ben Graham suggested back in the 1930s. The Graham and Dodd PE ratio (more commonly called PE10) uses ten-year average earnings and it gives a far more stable number to compare share prices against. In turn, the PE10 ratio provides a far more reliable indicator of value than the standard PE ratio. Only invest in a company if its price to ten-year average earnings ratio (PE10) is below 30. Only invest in a highly cyclical company if its PE10 ratio is below 10. Stock market investors should focus on the long-term, where “long-term” is generally taken to mean five years at least, although ten years is probably a better minimum. If your time horizon is one day then share price movements are essentially random. There is about a 50% chance they’ll go up and a 50% chance they’ll go down from one day to the next. I don’t know about you, but I don’t like those odds, and the same is pretty much true of price movements over one week or one month. Dividends are always positive and never negative, and the longer you hold your shares, the more these always positive returns will drown out the short-term ups and downs of the stock market. For example, an investment with a 5% dividend yield will generate a return of 25% over five years from dividends alone (and ignoring the potential for dividend growth). This massively increases the odds of you achieving a positive result over those five years compared to your odds of a positive return over a day, a week or a month. If your time horizon is five years or more then you are likely to see your dividends grow, assuming you’ve bought into high quality companies. Good companies often increase their dividends by more than the rate of inflation, and increases of 5% or more in a year are not uncommon. 5% dividend growth each year for five years will lead to total dividend growth of more than 25%, which is obviously good for your income. But it is also likely to be good for capital gains as well. That’s because a 25% higher dividend will very probably help to drive the company’s share price higher. And if you give it enough time, these dividend-driven share price gains are likely to drown out the short-term ups and downs of the market. Unfortunately our media has long followed the strategy of “if it bleeds, it leads”, so the media is far more likely to report on negative issues than positive ones. In the world of investing this means endless sensational headlines about how billions have been wiped off the value of a company or the market, but never a word when those billions are wiped back on again a few weeks later. This sorry state of affairs causes many otherwise sensible investors to panic sell when one of their investments runs into trouble. This often means selling at a loss when shareholders and the share price are depressed, but before the company has had a chance to recover (as they often do). However, if your investment horizon is five years or longer you will find it far easier to hold on through these tough periods while you wait for the company to fix its problems. Once the problems are fixed, and sometimes even before, investor sentiment may change for the better. At that point more and more investors will start buying, and that’s likely to drive the share price back up again. Now, I’m not saying you should hold on forever, no matter how badly a company is being run. But a little patience is definitely a virtue. Only invest in a company if you’re willing and able to hold it for at least five years. No matter how much research you do into a company, you cannot know for certain how it will perform, or what the share price will be in the future. However, you can be fairly certain that a diverse group of high quality dividend growth stocks will perform satisfactorily, given enough time. The answer then is to diversify by putting your investment eggs into many different baskets and then keeping those baskets as far apart as possible. The first and most obvious route to diversification is to invest in many different companies. Twenty is a commonly cited minimum, although thirty may be better for investors who are more risk averse. Just as important as the number of companies is the amount invested in each one. There is no point holding thirty companies if one company makes up 80% of the portfolio, so position size is the next thing to watch. Your preferred maximum position size is a personal matter, but 10% is probably a reasonable maximum and personally I trim back holdings that exceed 6% of my portfolio (one way to rebalance a large holding is to sell half the position and reinvest the proceeds into other companies). Companies within the same industry or sector are often affected by the same issues, so diversifying across many industries will help to reduce risk even further. If a portfolio is diversified across many industries, anything that affects one particular industry will only have a relatively small effect on the portfolio. Rather than specifying the number of industries to invest in, I prefer to specify the maximum number of companies my portfolio should hold from any given industry. For example, if you hold thirty companies then you might restrict yourself to no more than three companies in any given sector. It’s also a good idea to spread investments between defensive and cyclical companies. This will allow the portfolio to maintain a relatively defensive stance while attempting to capture the positive swings in value that cyclical companies can provide. Nonlife Insurance Household Goods & Home Constr. The same approach to diversification can be applied to geography. The goal here is to reduce the impact that a geographically local problem – such as a recession, an earthquake or a war – has on your portfolio. If you are a UK-based investor then you have easy access to many companies that operate internationally. Most companies in the FTSE All-Share index will have significant operations in the UK, so the key concern for UK investors is to make sure the overall portfolio is not overly dependent on the UK economy. As well as providing some protection from the impact of a UK recession on the portfolio, investing internationally will also give the portfolio exposure to faster growing international markets. Keep each position small enough so that you would not be overly upset if one of your investments went bust. Hold around 30 companies with a default position size of about 3% of the portfolio. Cut in half any holding which grows to more than twice the default position size (i.e. more than 6% of the portfolio). Invest no more than 10% of the portfolio (e.g. three out of 30 holdings) in any one FTSE sector. Have at least one third of the portfolio (e.g. 10 out of 30 holdings) invested in defensive sector stocks. Have no more than 50% of the portfolio’s revenues coming from the UK (or any one country for that matter). After you’ve found a high quality company, bought its shares at an attractive price and held them for a number of years, there may come a time when it makes sense to sell. And how and why you sell is just as important as how and why you buy. As I’ve already mentioned, panic-selling because of a negative announcement or new story is usually a bad idea. To put it bluntly, selling should not be driven by fear. Instead, your sell decisions can be an important part of your investment toolbox. You can use them to increase your dividend income, increase your capital gains and reduce your portfolio’s risk. The best reason to sell shares is when a company has performed well, but the shares have performed even better. Let’s say you invested in a company when the starting dividend per share was 5p and you bought those shares for 100p, giving you a dividend yield of 5%. Ten years later the divided has doubled to 10p (a 100% increase) but the shares have gone up five-fold to 500p. Although the dividend has grown to 10% of your initial investment, it is now just 2% of the company’s current share price. Imagine that you then found another company with dividend growth prospects just as good as the first company. Except, this second company has a dividend yield of 5%. In that case, it might be a very good idea to sell the shares the shares with a 2% dividend yield and reinvest them in the company with the 5% dividend yield (in reality I would also look at the PE10 and PD10 ratios, but the principle is the same). That would more than double your income overnight. This is know as “taking profits” and it can also reduce risk. That’s because – all else being equal – a share with a higher yield and lower valuation has more price “support” from its dividend, which just means the share price is less likely to go down because investors are attracted by the high yield. Repeatedly moving to higher yield, lower valuation shares of high quality companies will help you keep this “valuation risk” to a reasonable level. Selling proactively rather than reactively can be achieved by selling the least attractive holding on a regular basis. Rather than reactively waiting for disaster to strike, or for a company’s shares to hit a particular price, a better approach is to have a fixed schedule where you sell your least attractive holding every other month or so. This takes away much of the stress of investing, because you always know when your next sell decision is due and for much of the rest of the time you can more or less ignore your investments. Once an investment is sold you would then replace it the following month with a new company which has a better combination of yield and quality. There is no such thing as perfection in the world of investing. Every investment strategy can be improved and every investor can enhance their knowledge and skills. If I’m honest, I know there are many other investors who are smarter, harder working and far more experienced than I am. It would be foolish of me not to take advantage of that fact, learn from their successes and mistakes and make use of those lessons where possible. 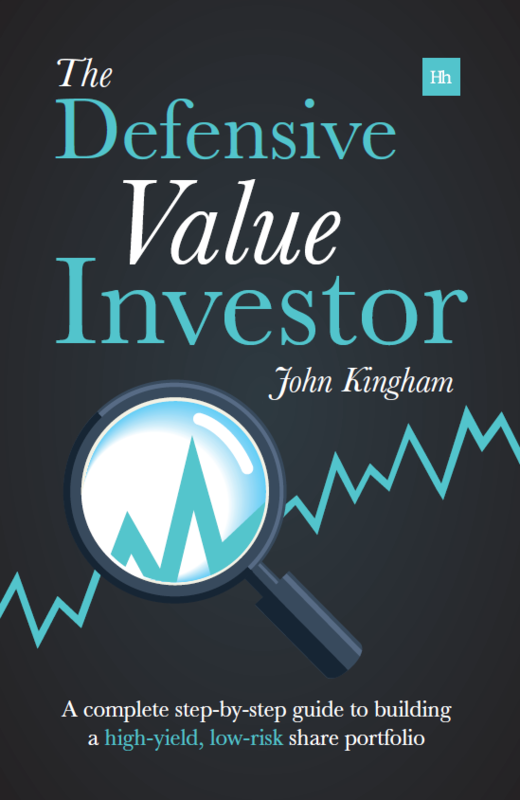 And yes, of course my own book The Defensive Value Investor. However, I’m also a firm believer in evolutionary rather than revolutionary improvements, so once you’ve found a strategy that works for you, you should be looking to stick with it and incrementally improve it over many years. Reading is important, but I think the most significant lessons will come from your own experiences as an investor. So when an investment goes wrong and you make a loss, don’t run for the exit and attempt to banish the mistake from your memory; use it as an opportunity to learn and improve. Do your best to understand why you made the mistake, or if it wasn’t a mistake then find out why the investment turned out badly. The knowledge that you gain from this analysis, if applied intelligently to multiple investments in the future, could lead to additional gains that are far beyond those you could have achieved if the original investment had turned out well. After every investment (and sometimes before the end of an investment) try to understand what went right and what went wrong. Try to repeat your successes and try to avoid repeating your mistakes. Update your investment strategy as required, but don’t stability is important too so don’t change it too drastically or too quickly. If you’d like to know even more about this approach to investing, or if you’d like to try it out for yourself, take a look at the resources below. And if you have any questions, please do get in touch. 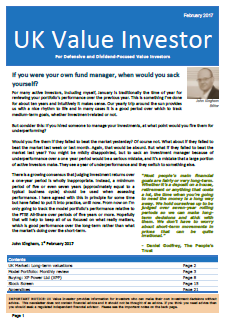 Hi John excellent framework the only point I would remain sceptical of is diversification. Investing is the art of managing risk and being able to accurately forecast the future performance of a company or near enough. This does require a good understanding of the fundamental of the company. Unfortunately few of us have the capacity to understand the workings of more than two or three industries. I think a more strategic way of diversifying is buying into various index funds which in theory should help capture the performance of the market. However to do so requires the understanding Q ratio to ensure you are not over paying. Hi Reg, Thanks. Generally I agree, investors who don’t want to pick individual companies to get (for example) a higher yield with less risk than the market should just own an index tracker of one sort or another. However, I don’t think trackers are necessarily a more “strategic” way to diversify; they’re just different and a portfolio of individual companies can easily be more diverse and lower risk than an index like the FTSE 100 (the FTSE 100 being a good example of a relatively concentrated index). Also, its interesting that you mention Tobin’s Q as I’m a fan. It’s probably the best market valuation ratio, but CAPE (cyclically adjusted PE) is generally easier to calculate and is just as useful in the real world. I agree I spent the best part of a week to get the Q value for the FTSE all tracker share. It is very cumbersome but nevertheless a comprehensive way to assign the degree of overvaluation. The only issue with Q value is figure is skewered by growth companies which have unrealistic valuation and these sit next to companies which have been fairly priced. Therefore the market as whole may look overvalued but the same rule does not apply to individual companies. If you look at Netflix and Disney, Netflix has a P/E ratio of 210 but Disney 15.96. This is likely to skewer the Q value and may lead to the consensus that the market is overvalued but in reality, Disney is fairly priced for what it offers on the table. On the other hand investors face disappointment if Netflix fails to sustain its current growth. Nevertheless, if Q value is applied to specialist index fund then it may be of some use to an investor. As specialist index fund lump together similar assets therefore its Q value indicates whether the index fund is reasonably priced. Yes, I definitely agree. If you have the data then Q is a viable alternative to (and possibly better than) CAPE. I think CAPE and Q are both useful measure for the overall value of a given stock market. But nothing beats good old common sense. If the underlying group of companies are mostly struggling then people should abstain from investing in an index fund relating to that stock market. This is demonstrated by the performance of Japanese Stock Market which has been doing abysmally since the early 90s. The issue is obvious Sony, Toshiba, Canon the heavy titans of Japanese Stock Market have been outmanoeuvred by international companies. Unless of course it is forced to massively overpay for Fox, which Comcast bidding has a good hand in for it’s all cash offer. Unless also the streaming service is not successful and it’s hard to convince the American public to keep signing up for more and more subscription services. Also, and assuming they are successful signing up Fox for huge sums of money, there is no guarantee that they can manage two sets of studios located on far coasts of America with few real synergies. Recently sold Disney because of these uncertainties. Q theories are all very nice and theoretical, but companies may look overvalued, when not, they may also be undervalued when they appear to be so. It’s difficult to foresee how the Disney deal will pan out. From my understanding, it was an all-stock deal but it will be interesting to see what happens eventually. John – Thank you for good article. To Reg comment: I 200% agree that “few of us have the capacity to understand the workings of more than two or three industries. ” So WIDE diversification should help esp. because only ~ 5% of US companies during last 90 years were profitable for stock investors (see https://seekingalpha.com/article/4042396-many-investors-fail). I guess numbers for UK or any other country would NOT be significantly better. But with an ETF you probably do not deeply understand their holdings beyond mentioned “two or three industries” and even less for their rebalance (even if it spells out in rules). I prefer to build wide portfolio of stocks than go with ETFs because I have more control (1) and in long run it is cheaper (see http://seekingalpha.com/instablog/725729-sds-seductive-dividend-stocks/1463661-fees-and-holding-period). 1. Well…. I got note today about Fidessa/ION deal – it seems that I have to sell my Fidessa shares, lost position, have capital gains, etc…. Thanks SDS. For me the funds vs stocks issue is just one of suitability. If you don’t want to analyse companies and don’t mind not knowing what’s in your portfolio, then funds are the better option. If you like analysing companies and want a more direct and hands-on form of investing, then individual stocks can make sense. It’s horses for courses, as they say. Congratulations for your website!! You are an example to follow! May I ask one question please? My employer’s pension contributions go into Zurich pension which doesn’t have Vanguard LifeStrategy funds…Do you recommend any alternatives with fair ongoing charge ?